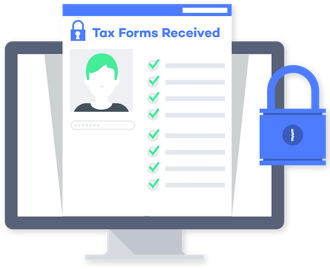 Secure Messaging Platform For Tax Professionals. Collaborate with your clients & colleagues, increase efficiency and grow your practice. I love Taxjoy because it helps me while also helping my clients, and that's a win for us. Taxjoy lets you communicate with your clients in a streamlined and secure way. All messages are organized by client so you can easily find what you are looking for. No more searching through emails. And, all messages are sent, received and stored in a secure manner, removing the security risks of using an email app. Taxjoy lets you and your clients share documents easily and securely. All documents are automatically organized by type (W-2, 1099, etc.) to make the tax preparation process easier. You don’t have to look through your emails anymore to ﬁnd what you need. Taxjoy lets you assign tasks to your clients, yourself or other team members. No more excuses for anybody to miss a deadline. Click any category to see what Taxjoy can do for you and your tax client’s needs. Send and receive documents easily and securely. Manage all clients documents in a single place (like a DMS).Have documents organized by type (W-2, 1099, etc.). Manage all clients from a single dashboard. Manage a client profile. Assign a client to a colleague. Change client status, manually or automatically. Connect client activity to practice management systems. Collaborate with team members and see the same information on every client. Manage multiple entities for a client. Keep notes on clients. Easily send invoices to clients. Process payments quickly and easily. Accept credit card payments. Accept ACH payments with one click. Track outstanding payments. Send automatic payment reminders to clients. Receive automatic notifications about client issues, such as: When a taxpayer starts a new job. When a client opens a new bank account. ACH processing fees starting at 1.9%. First 100 e-signature requests are free. $1/signature thereafter. Attractive Credit card processing fees. How does pricing work and what’s included? Our monthly price is simple and transparent. Everything is included in a single charge. No hidden fees or surprises. What kind of integration does Taxjoy support? In the future we expect to provide APIs and integrations with leading software providers in the accounting space. If you would like Taxjoy to be integrated with a particular solution, please send us an email at support@taxjoy.com. You own the data that is associated with your account. If you are a tax professional, you own the data that your clients shared with you. If you are a taxpayer, you own the data that you uploaded to the system, as well as data that your tax professional shared with you. How secure is my data on Taxjoy? As secure as a world class bank. Data is fully encrypted at rest and in transit using 256-bit SSL encryption. We employ state-of-the-art ﬁrewall and backup technology, and our data resides in high-security, access-controlled data centers. Please refer to our Security page for more details. Does Taxjoy have customer support & what is the cost? You can contact the Taxjoy Support team any time with your questions or suggestions, at no additional cost. Just email us. You can easily reset your password if you click the following link. What if my clients need help with Taxjoy? Taxjoy provides a free built-in support widget inside each account. Similar to the support widget you see in your account, your clients can easily communicate with our customer success team with any questions or requests. What if I change my email? All data is transmitted with 256-bit SSL, the highest encryption standard available and the same technology used by ﬁnancial, military and government organizations. All information provided by you and your clients is kept private and is not accessed by anybody, even Taxjoy employees, except on an exceptional need-to-know basis. The data centers we use support multiple layers of security to control access, including biometric scanning, keycard, retina scan and PIN number restrictions. Security cameras monitor all locations 24-by-7 and onsite staff protect against unauthorized entry. In each facility, our equipment is kept in locked container-fluids, with additional security safeguards in place to ensure only permitted technicians gain access. All information is backed up multiple times each day and in multiple secure locations. Taxjoy is on a mission to help ﬁnancial services professionals make better decisions when serving clients. 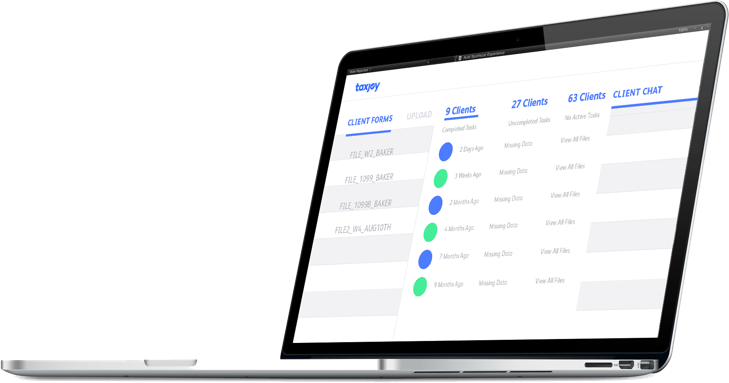 Taxjoy’s ﬁrst product is a CRM for tax professionals. We focus on a unique user experience and data engineering to enable tax practitioners better communicate with their clients and leverage their skill set based on automated insights from data.